This scrubbie is an environmentally-friendly crochet project, and it's frugal too. Rather than buying scrubbers at the store, you can make them yourself, and in the process you'll be able to save a little cash. This project is made using mostly free materials, as well as materials that many people would otherwise toss in the trash. The scrubbie is crocheted using "plarn," AKA "plastic yarn," and its scrubbing power comes from a scratchy textured produce bag. Learn how to make plarn. This scrubber works well, but the pot scrubber pattern is a bit more flexible and a little more abrasive. If your pots have excessive amounts of burned-on goo stuck all over them, skip this scrubber and go for a scouring pad instead. You can use this plarn scrubber on everyday dishes rather than on your fine china. For the fine china, I think it would be better for you to use a lovely crocheted dishcloth. The stitches used in this pattern are all very easy, but this pattern is intermediate because plarn is a bit more challenging to crochet with than ordinary yarn. For the crocheted part of the scrubbie, use two ordinary grocery shopping bags.Have at least three grocery bags on hand in case you use a bit more, or in case you need to correct a mistake. 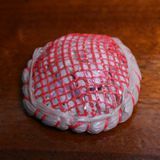 For the "scrubber" part of the scrubbie, use a small bit from a plastic mesh bag such as used for oranges, onions, avocados, lemons, limes, etc. Do not, under any circumstances, use trash bags to crochet this project; some trash bags contain pesticides, and you absolutely do not want pesticides to come into contact with your dishes. It's better to use bags that are safe for coming into contact with food and groceries. Tapestry needle for stitching one part of the scrubbie to the other; you'll also need some thread-like material. Instead of using actual thread, I pulled out a bit of the orange bag and threaded it through the needle. (See photo c above.) It worked fine for me, but if that doesn't work for you, ordinary sewing thread should do the job. Gauge is not particularly important for this project. If your scrubbie turns out too small, start over using a larger crochet hook; either that or add an extra round or two. If it somehow turns out too big to be useful (which is unlikely), start over using a smaller crochet hook. The scrubber measures approximately 3 inches in diameter. Cut a plastic grocery bag into one long, continuous strip measuring approximately 3 inches wide by however long it turns out. If you run out of "plarn" at any point before round 3, cut up a second grocery bag, in the same way, join it, and keep crocheting. The crochet pattern below gives you a scrubbie that is gently concave; It's easier to hold onto and scrub with than a flat circle would be. However, if you'd like yours to lie perfectly flat, you can use the first 2-3 rounds of just about any crochet circle pattern as a substitute. Using the grocery bag, ch 5; sl st to form a ring. Round 1: 8 sc in ring. Sl st to join to beginning of the round. Ch 1. Round 2: Working in back loops only, work 2 sc in each sc all the way around. You'll end up with 16 sc total. Sl st to join to the beginning of the round. Round 3: Sl st in back loops of each sc st in the previous round, all the way around the piece. If you run out of " plarn," you can just end off at that point. Otherwise, end off when you've finished working a sl st in each sc st around. Weave in / cut off your loose ends. At this point, you have a crocheted circle. It could be used as a scrubber, but the scrubbing power wouldn't be too impressive. It's the next step that makes this more of an effective scrubber. Next, use the crocheted circle as a template for cutting around the produce bag as in Photo d.
Stitch the cut-out circle-shaped piece of produce bag onto the crocheted plastic circle shape. Cut off the handle of another grocery bag, making sure you have a piece that is larger than the circumference of your crocheted circle piece. You're going to use this piece to camouflage the rough edges of the produce bag. See photo (a.) above for an example of how this is going to look when it is finished. Thread your needle again and manipulate the piece you cut out from the grocery bag handle so that part of it is on the top and part of it is on the bottom, with it wrapping around. Stitch around it as you go. When you've stitched all the way around, be sure to go a bit past your starting point to be sure that it's reinforced. Then hide the end inside the piece and cut your "thread." Your scrubbie is now ready to use. Enjoy the cost savings! Here's hoping you never have to buy scrubbers again.